Sharing a portrait that was created many years ago by Arto Chakmakjian, an internationally renown Canadian-Armenian sculptor. The funny thing is that the portrait was made when he was a young aspiring artist in Soviet Armenia after his family repatriated from Egypt in 1948. 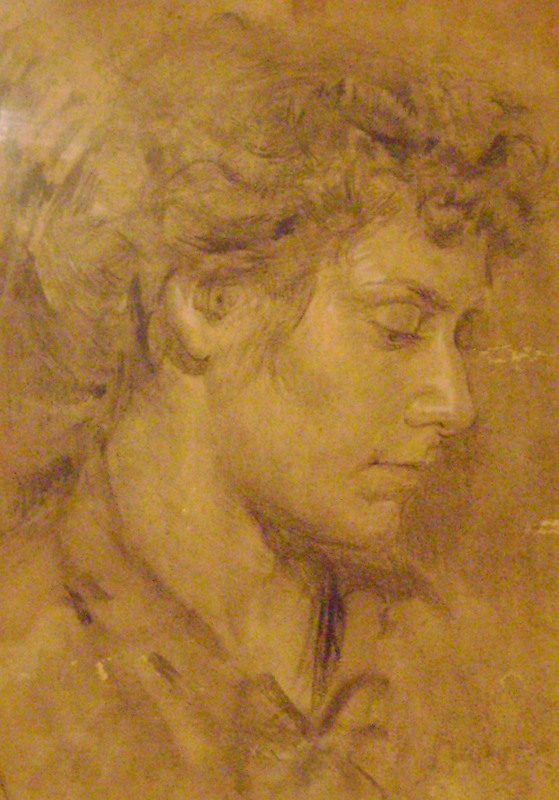 The portrait is of my mother. It made it through the Soviet years, unlike a bust that he made of my uncle. The portrait hangs in my studio, empowering me to tell the story of the repatriates. See an article in the Armenian Reporter about Arto (2009), which says in part, "The aspiring artist went on to become a researcher at the Academy of Arts and Sciences while continually and consistently creating sculptures that won international recognition...Arto Chakmakjian was one of the first Armenian artists to try and break through rigid ideological concepts of social realism and tried to introduce news styles in sculpting. For this reason, he was persecuted by Soviet authorities." Sometimes I stumble across such interesting things when doing my research: Here is a photograph from an American repatriate (June Spooner Maynazarian Narzakian), whose ancestry is not Armenian, but Polish/English. Her step-father (an Armenian) took the family to Soviet Armenia from New York in 1947. June ends up marrying another repatriate, an Iranian-Armenian, who is a filmmaker. During my time with June, I found this family photograph of her husband, Paramaz, with the noted Armenian painter Martiros Saryan (left). I visited Providence, Rhode Island the last week of June and met with Chris Lefian (first American caravan), June Narzakian (first American caravan), and Kay Derderian (second American caravan). Three beautiful ladies and three wonderful stories! 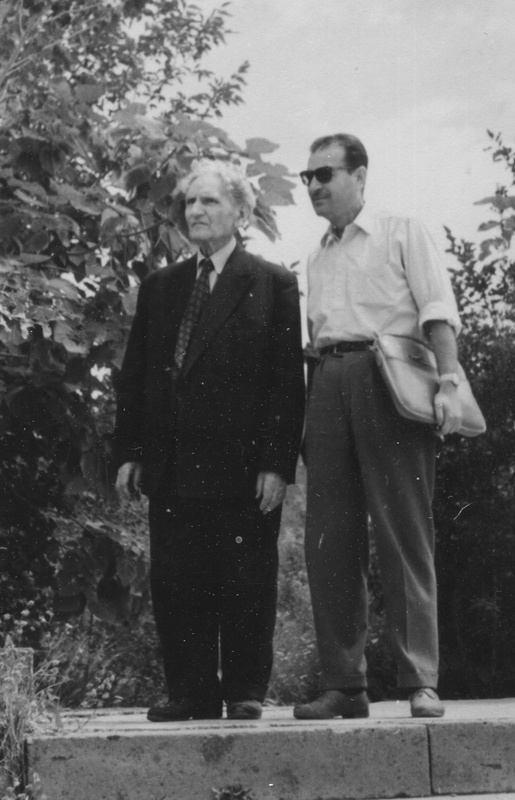 I found a photograph of June's husband, who was an Iranian-Armenian filmmaker, with Martiros Saryan. Sometime this Fall I will be posting these additional photographs that I scanned during my visit. I also finished reading Vasily Grossman's An Armenian Sketchbook. It was written in the early 1960s during the time when many of the post-WWII repatriates began leaving Soviet Armenia. Grossman's accounts, however, are more of the Armenian villages, and they are quite interesting ethnographically. The students of the Charents school were experiencing a historical first. English was being taught on a regular basis and the program began with three teachers, two of whom were American-Armenian repatriates. 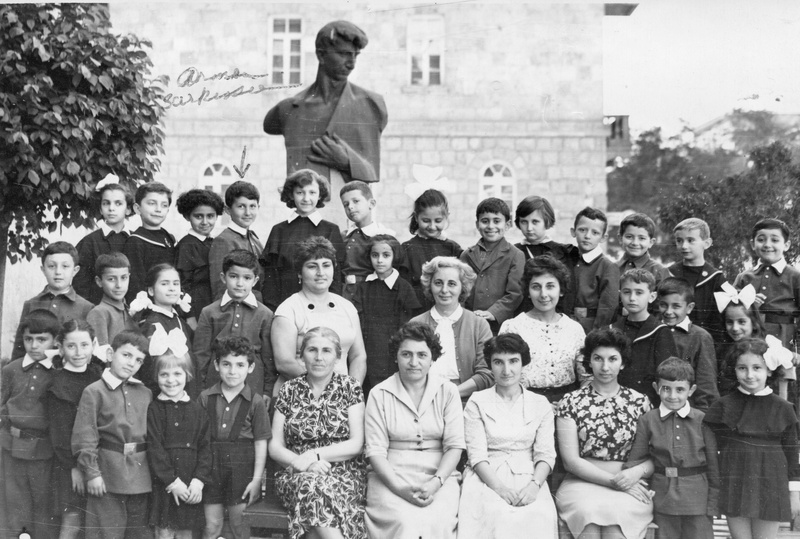 One of these students, a student of Kay Derderian was Armen Sarkissian. Armen eventually became the Prime Minister of Armenia from 1996 – 97, and before that he was the Armenian Ambassador to the UK, Senior Ambassador of the Republic of Armenia to Europe (Deputy Foreign Minister). Photograph Courtesy of Kay Astourian Derderian, 2012. The lecture and sampling of my art work at the event in Burbank on May 22 gave me a wonderful opportunity to meet more people interested in the project. I also met with repatriates who I had interviewed last year and met others with whom I had had only written correspondence. Prior to my visit, I had created a 30-minute video film to show at the end, what I call my tribute film, but my computer let me down. I could not convert my final working footage to a final movie, so instead I had to present my "Fresno" tribute version in Burbank. I will be working in the interim to change this for my next speaking event. The studio art film that I created looked very nice on the big screen at the back of the lecture hall. For those who may never have the chance to see my artwork in person but who are interested in seeing it up close, I plan to post it on my Home Page sometime this Fall. Thank you to those who came up to me and introduced themselves--I hope to maintain periodic contact and develop longterm meaningful friendships! One of the first people to attend my first presentation, March 2013, was a very tiny, elderly woman named Emma Latchinian. She told me that she took two buses to get to the UC Center, where the Armenian Exhibition Hall is housed. In Fresno, taking a bus is not an easy maneuver, but she did it. I chatted with her a bit before I began my talk and was enamored by her quaint charm. At the end of the talk, she came up to me and told me how much she enjoyed the presentation. But what she said next has stayed with me since. She told me "antaram menas." The word "antaram," which is the base of my last name, means, "everlasting." In essence, she told me to "be everlasting," and continue the work that I am doing, as defined by the meaning of my family name. Thank you Emma, I shall do that. I gave a brief tour to the 6th grade kids and their teachers from the Rose and Alex Pilibos Armenian School in Los Angeles. They were visiting sites in the Central Valley, and one of their stops was the Armenian Museum Exhibition Hall in Fresno. The kids were wonderful and several asked very thoughtful questions. The educational interaction between children and my project is worth the long hours and grueling schedule that I keep to make it all happen! I hope to see many of their teachers and parents, as well as the kids at the May 22nd event. The scheduled audio-visual presentation of "Repatriation and Deception" in Burbank on May 22 is an expanded version of my debut presentation in March at the Armenian Museum in Fresno. As I learn more from the repatriates via stories, photographs, and written works, I enrich my talks even further. I want each one of my presenations to offer new information or perspective on the general history of the Great Repatriation. For the May 22 event, I want to personally thank the Davitian, Melconian, and Tashjian-Kezian families for their support in arranging the show in Burbank, and I extend my thanks to the Western Diocese Church of Armenia for the gracious use of the Zorayan Museum Hall. While the show is limited to a few paintings on the day of the presentation, I am elated and grateful for the opportunity! On May 13, 2013, I met Richard Kalinoski and his girlfriend, Cheryl, at the Museum Exhibition Hall. I was joined by my sister, Jacqueline Antaramian, as we reflected upon my work as a response to the history of the repatriation. Richard and Jacqueline were in town to meet with several individuals at Fresno State University in the preliminary stage of discussion regarding the commissioning of a new play for Spring 2015. Richard is the playwright of "Beast on the Moon," an award-winning and internationally acclaimed play about the Armenian genocide. On April 24, 2013, I had the privilege of giving the former US Ambassador to Armenia, John M. Evans, a tour of my artwork. He was very engaging and thoughtful in his understanding of this period in Armenian history. He was especially pleased to find out that the "Dear John" painting was done in his honor. The two panel painting (48 x 48 in each panel) is a tribute to the former US Ambassador to Armenia, John M. Evans. It is acrylic-based mixed media that includes a collage of a newspaper article regarding the events behind his 2006 dismissal after he used the word "genocide" within the context of Turko-Armenian history. The Gallery contains several more photographs of the tour.